Peat, and sometimes Angus, but always at least one of them wakes us about 4 a.m. wanting to be fed. This has been going on for more than two years. Peat’s the ring-leader, and most aggressive. He’ll start by pacing and softly whining, which ultimately crescendoes to a series of Bo Jackson-esque runs at the foot of the bed, and a spin-bounce off it back onto the floor. Brittany body-slam. He’ll do this until we feed him. We’ve tried lots of things: totally ignoring it until the alarm rings (our latest, failed strategy); shutting them out once they get off of the bed (which leads to them scratching at the door at odd intervals like some horror film scenario); making them get back on the bed and ordering a stay (never works for long). Until very recently, we’d been doing what I’m sure is the absolute wrong and worst thing: giving in and feeding them so we can at least get another hour of sleep before the alarm rings at 6 a.m. Last night I wondered if the e-collar might be worth a try, but didn’t get up because I thought it would be another victory for far smarter Peat. So, if anyone has advice that might nip this well-developed habit in the bud, we’d love to hear it. The dogs will continue to sleep with us, so that’s not negotiable, which I realize might seal our fate on this as losers (of sleep, of dignity, of probably years of life caused by bad sleep). On an up note: Leslie had a great day yesterday, the penultimate day of the season. Maybe she’ll tell you about it. She’s planning to go out again today for the win while I slave away with dangling modifiers. I to have two Brittany’s. I feed them once a day in the mid afternoon. They get a ‘snack’ after their morning walk. I write this whilst in bed at 6:50 am with my Brittany’s still sound asleep. I’m not a fan of twice a day feeding. Glad your back is feeling better. My two dogs start in on me when I rise at 5a or so. Ii put them down while I catch up computer and only then I feed them at 6 or a little after. Temporarily, you might try putting them in travel crates at night in your bedroom. One of my two brits does the same thing. Crating him for a few nights seems to break the pattern of behavior. Giving in to feeding reinforces the habit. At some point you mentioned that you were thinking about the Wingworks vest. I’ve used it for years and love it. Designed by a diehard chukar hunter in Hailey. Can carry a lot of weight, very rugged, shell pouches placed so they don’t interfere with motion. I prefer water bottles over a bladder b/c I can keep dog water separate from my water. I give water in a zip lock or collapsible bag and pour the unused water back in the bottle to conserve and therefore carry as little in possible. Thanks for your thoughts, Robb (including on the Wingworks). The crate thing has backfired when we’ve tried it in the past. I think we might just be, as Larry said, screwed. There are worse things, though. “Jumping off the bed, Peat got up earlier and earlier.” Is that a dangling participle? I think you’re hosed. Undoing two years of behavior is going to be tough. Perhaps start by choosing a morning when Peat gets up first, but Angus is still sleeping well. (Maybe give him a good run the night before.) Then, rather than just banishing Peat outside the bedroom, put him in his crate so he can’t scratch at the door. Hopefully Angus will get the message and stay quiet in bed. Of course this may lead to Peat whining or barking. Then you have to banish him to the garage or outbuilding, and the war escalates. Thanks, Larry. If you say we’re hosed, I’m inclined to agree. We tried the crate thing, with the results you suspected. And yes, by Thursday each week, my life IS a dangling participle. After two years..could be tough. You could try letting them out but not feed. Your up anyway at this point. They might then settle back to bed as the reward not the food reward that getting up has at present. Just an idea. Obviously there is no quick fix. Oh yea what time do you get up on hunting days? That could play a role in the present behavior as well. Knowing Brits (having had four) change is hard. I feed my 7 year old once a day at 4 pm and he gets a large milkbone as soon as I get up. You might try giving Peat and Angus a good treat at 5 am and hope they come back to bed. I hear you, John. Change is tough with these guys. I might try your idea; am thinking of keeping a bear-proof milkbone container near the bed so I can “throw them a bone” and I can stay in bed. Time will tell. Sorry to hear that YOU have been trained. Apparently your dogs are not sure YOU are alpha dog. The only way out now is to crate them at night in your room. If they fuss at 4 am, command NO!. If that does not work pull them out of the crate and shake them up. Pick them up (by the scruff of the neck and skin at hips) and shake. Command NO! put them back. They will soon figure out you are alpha. No means NO! Bob, I have a partial solution: I will send you my cat, Blue on the next flight to Idaho. He requires a saucer of milk at precisely 4:45 a.m. He likes dogs. I will gladly take Blue, Angus and Peat for the half year split. I’ll even drive out to get them. Some idiosyncrasies are hard to deal with. Ron, you are a gentleman and a scholar for sure! Leslie and I both guffawed heartily at your offer. Thanks for that. I’m afraid, however, we’ll have to respectfully decline as we’re currently trying to wean ourselves off of the feline race. One left, and he’s the world’s luckiest cat, seemingly destined to set all kinds of longevity records. The responses to this post have convinced us of a number of things, the clearest of which is that we’re terrible dog trainers and that we’re stuck with damaged sleep. Not exactly apropos of the preceding thread, but now that it’s “hot-stove” season for Idaho chukar hunters, I wondered if you ever contemplated using nontoxic shot for chukars. 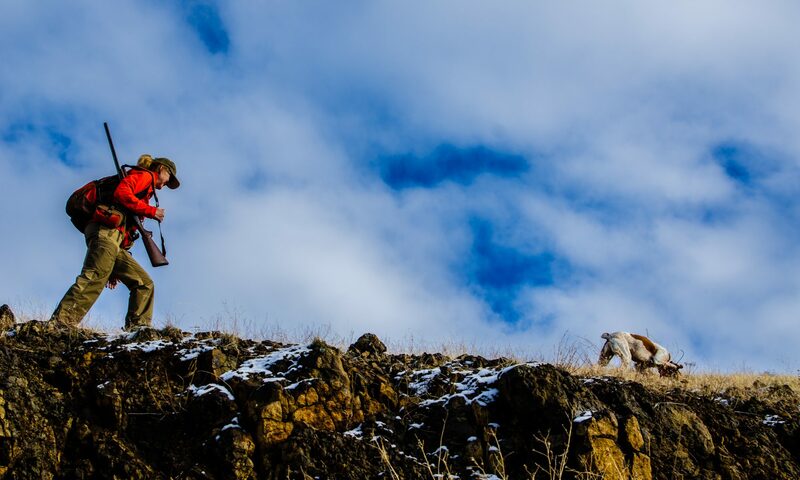 I know of two studies–one in Utah, one at Succor Creek State Park in Oregon–that observed consumption of lead shot by a surprising percentage of chukars. There’s also some relatively recent work on lead shot ingestion in red-legged partridge in Spain and the sublethal effects thereof. And from time to time, I’ve wondered about its health effects on me, either via ingestion or dental trauma. To reduce the latter, I’ve resorted to hand loads with nickel-plated #5s, but wonder if I ought to switch to bismuth or steel. Of course if I used the former, I’d have to get a second job to afford my chukar habit. Just some food for off-season thoughts. And another shout out for the WingWorks vest. Mine’s about 10 years old and still solid. Thanks for this, Michael. I’m always contemplating nontoxic shot, but have rarely done anything about it. If I had more time I’d probably opt for your approach, although I think I’d be frustrated with performance of any load I came up with compared to what I’ve been using. I mainly use 7-1/2 and have been satisfied with achieving a .400 batting average in the chukar playoffs; how do you think the #5 works for you? I’ve used #6 steel a bit, but have felt — with my shooting skill — I don’t get enough pellets (my batting average goes way down). Ongoing question. But yes, I’d rather use nontoxic all things considered. Thanks, also for the nod on the WW vest. I certainly miss more than I hit, but I like to blame that on using a flushing dog. Very rarely do the birds retain any pellets, so at least my teeth are fine. Once I use up my supply of lead shot, though, I will probably switch permanently to bismuth. If you are consistent, firm, and patient, you can re-train your dogs. The initial stages will not be that much fun because of the established pattern, but you’ll be establishing a new pattern you can live with. By the way, if you haven’t read it already, you might enjoy “Inside of a Dog” by the cognitive scientist Alexandra Horowitz. I don’t see any reason that the dogs being in crates (within earshot) would be any different than the dogs being on the bed. They would wake you from their crates in the morning to get you to feed them. Have you tried feeding them a handful of kibble in the evening to keep them from getting hunger pangs at 4? Perhaps a bit of food at night will help them to sleep until the alarm sounds? Thanks, Mark. I appreciate your suggestions. I agree on the in-room crate result. Plus, one of my greatest pleasures in life is going to bed with Peat in my armpit. We’ve tried the just-before-bed treat thing, and it hasn’t worked. We’ve also tried feeding them as late as we can bear it, without noticeable difference in the start-time of morning hunger games. The suggestion of feeding them once a day, at night, is intriguing, but not sure if we can swing it (the transition would be pretty painful, I imagine). They are clearly old enough to live on their own. It is time they get jobs and pay for their own meals…….nevermind. I thought you were talking about kids. No advice here. Being spoiled at home is something older dogs have earned. Thanks, Jay. I agree. We’re working on their interview skills right now. Just hope they don’t end up on the 11 o’clock news. Bob, have you no children? The similarities with your dogs are numerous. You don’t let your kids/dogs sleep in your bed, unless you enjoy or at least tolerate the interruptions to sleep or other activities most of us engage in while in bed. If you value sleep at 0400, fear not your false perceptions of any damage you’ll do to your dogs, and put the dogs in an area where they can’t wake you and let them howl until it’s the dinner time you choose.